Here's the second installment of the 12 Days of Christmas with Maryland Pink and Green! Today's giveaway is sponsored by the lovely peeps at The Pink Pelican, the only Lilly Pulitzer signature store located in Alabama. The store is large and always has an excellent selection. I love to support signature stores and the personal touch you'll get from The Pink Pelican makes shopping a fun and enjoyable experience. If you're looking for items from the latest Resort collection, Pink Pelican has all of my top choices! The Lilly Pulitzer Kelli Coat in black cotton sateen is so elegant and versatile. Wear this coat in three seasons with both casual and dressy outfits. The black is such a great basic, but there's a pop of pink in the lining of the coat. So much fun. The Lilly Pulitzer Loreen Dress in navy jade colorblock is suitable for work or play. I'm loving the new posh ponte fabrics. They're so comfortable, forgiving and figure flattering, and won't wrinkle. Lately, I'm trying to add more things to my professional work wardrobe and dresses like this fit the bill quite nicely. 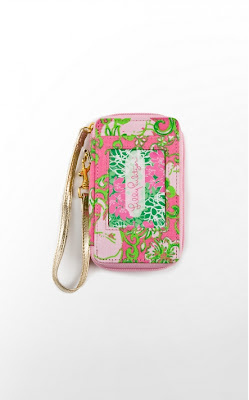 Everyone needs the Lilly Pulitzer Carded ID Wristlet in The Gang's All Here. I have this wristlet and love it! It easily holds credit cards, money, and a Blackberry. When I was in Florida for Lilly Pulitzer's 80th birthday celebration, I was at dinner with some friends when we realized that all four of us had the same exact wristlet. Shipping with The Pink Pelican is always free on orders of more than $200, but as a special holiday bonus, free shipping is included on orders of $100 or more. Everyone loves free shipping! You're also in for a treat with the free gifts that are included with online orders from The Pink Pelican. Be sure to sign up for their mailing list and VIP club to earn Reward Points for every purchase and know the latest from The Pink Pelican's promotions. They have a fantastic page on Facebook, too, with specials and great styling tips. As a special treat, The Pink Pelican is sponsoring the second day in the 12 Days of Christmas giveaways. Two lucky winners will each receive a Lilly Pulitzer Christmas Stocking. These are very special items and are difficult to acquire. You have many ways to enter to win, including leaving a comment, tweeting the giveaway, liking this post on Facebook, and more! Spread the word to your friends on social media sites and earn extra entries. To enter the giveaway, sign in with Facebook or your email and follow the directions in the widget. You have 9 possible ways to enter and can earn an extra entry every day for tweeting about the giveaway! You must use the widget for your giveaways in order to win. The widget creates the database for entries, not me. It's a wonderful new tool for giveaways. Thanks for joining the giveaway fun! Many thanks to my friends at the Pink Pelican for their generosity. Count me in for a chance to win please. Thanks so much for hosting such a fab give~away! What a great giveaway! Thank you for being such a great blog hostess! My favorite item from the website is the Chappy Trunks (Wave & Palm Tree)by Vineyard Vines. So preppy, and so cute! That was so funny when we all had the same wristlet!!!! What a nice giveaway! I'd LOVE an elsa top! I've just heard so many great things about it! I'd love to be able to hang my Lilly stocking by the chimney with care in hopes that St. Nick soon will be there! I love the Cassie dress!! What a fun giveaway--thank you. I love the Murfee scarf in Coral Cascade! My favorite is the Eryn dress in Chorus Girl! I love anything and everything Lilly Pulitzer, especially the murfees! Thanks for hosting this giveaway, it's fantastic! I'm loving the Bowen Dress in dress rehearsal! Thanks so much! I love the Jodie Sweater Bow Colorblock in True Navy! What a great giveaway! My Minnie said you have to enter for a Lilly Christmas stocking. I would love the Eryn Dress - Chorus Girl. BTW - Are you selling any of your Minnie's clothing. LMK either way. I am loving the win tags! great giveaway! Im loving PP's new website and love the elsa top in navy- matches with soo much! LOve those Just A Little Knotty Shoes in Navy! EYES on the Summer Mix Tote, too. I love anything in Late Night Toile! What can I say? I love it ALL! Ahh what a great giveaway! Love Love Love Lilly! I love the Kappa Delta murfee! I'm dying for the chorus girl bowen. fabulous giveaway! thanks so much! I love the Pink Pelican! Fantastic giveaway-I NEED a Lilly Stocking!!! I have been coveting the Lilly Whitaker Dress in Skip on it. LOVE it! How sweet- adore the Lilly Stockings and hope I win ! What a great giveaway! Thank you for being so sweet! Happy Holidays! I LOVE the Lilly stockings! Such a great giveaway! Oh my goodness, I LOVE the stockings! Love this giveaway! This would look so pretty in my house !! oh would love to win! I love the touchy feely, bling my chimes, and drama queen murfee scarves! I would love to win the Multi Sea Me stocking, one of my favorite prints! What a fun giveaway! I have done our powder room up in Lilly Christmas fun this year, and this would be a great addition! Cute! I love the Loreen dress - I just got one and it is so flattering. I like the Skipjack Polo - Greenville Green.